Background and Aims: The aim of the study was to compare the hemodynamic response to laryngoscopy and intubation after pregabalin and clonidine premedication and the effect of pneumoperitoneum on hemodynamic parameters in laparoscopic cholecystectomy. Materials and Methods: One hundred and twenty patients aged 18–60 years scheduled for laparoscopic cholecystectomy were randomly divided into three groups of 40 each. Group I received vitamin tablet, Group II received pregabalin 150 mg, and Group III received clonidine 200 μg as oral premedication 60 min before induction. The heart rate (HR), systolic blood pressure (SBP), and mean arterial pressure were monitored at predefined intervals, i.e., before giving test drug (T1), 30 min after the drug (T2), before induction (T3), immediately after induction (T4), immediately after intubation (T5), 1, 3, 5, and 10 min after intubation (T6, T7, T8, and T9), before creating pneumoperitoneum (T10), 15 min after creating pneumoperitoneum (T11), and 10 min after release of pneumoperitoneum (T12). Results: HR was comparable in the three groups preoperatively. Compared to Group I in Group II, HR was lower at T5 and also at T6, T7, T8, T9, T10, T11, and T12 intervals (P < 0.001). 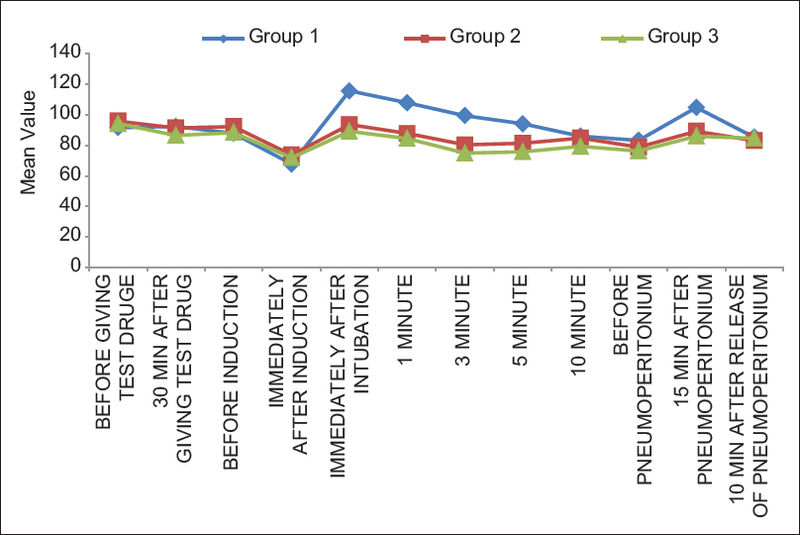 In Group III, HR was statistically lower at all the intervals after 30 min of giving the test drug (P < 0.05) compared to Group I. Compared to Group II in Group III, there was a significant fall in HR at T2, T4, T6, T8, T9, T10, T11, and T12 intervals (P < 0.05). SBP was comparable in all the three groups at baseline. Compared to the Group I in Group II, it was significantly lower at T3, T4, T5, T6, T7, T8, and T11 intervals (P < 0.05). Compared to Group I in Group III, SBP was significantly lower at T2, T5, T6, T7, T8, T9, T10, and T11 intervals (P < 0.05). In Group III, there was a significant fall of SBP at T6, T7, T8, T9, T10, and T11 intervals (P < 0.05) in comparison to Group II. Conclusion: Pregabalin 150 mg as premedicant obtunds the pressor response to laryngoscopy, intubation, and pneumoperitoneum with minimal side effects in laparoscopic cholecystectomy compared to clonidine. Laparoscopic cholecystectomy has revolutionized gallbladder surgeries and it has now become the gold standard for cholelithiasis. It offers many benefits than open cholecystectomy and is characterized by better maintenance of homeostasis. However, this procedure is not risk free. It can produce significant hemodynamic changes, especially in elderly. Pneumoperitoneum affects several homeostatic systems leading to alteration in acid–base balance, cardiovascular, pulmonary physiology, and stress responses such as increase in mean arterial pressure (MAP), decrease in cardiac output, and increase in systemic vascular resistance which, in turn, compromise tissue perfusion. Several techniques have been employed to prevent or attenuate the hemodynamic responses following laryngoscopy, intubation, and laparoscopy, such as deepening the plane of anesthesia and use of vasodilators such as nitroglycerin, lignocaine, beta-blockers, calcium channel blockers, and opioids., All these agents also have various adverse effects. Hence, search for an ideal agent continues which can effectively suppress both the rise in heart rate (HR) as well as blood pressure with minimal adverse effects. Pregabalin and clonidine have been studied extensively for postoperative analgesia, but very few studies are available on their use as oral premedication for attenuation of pressor response. Hence, we conducted the present prospective double-blind randomized controlled study to find the efficacy of oral premedication with pregabalin or clonidine on sedation, anxiety, and hemodynamic changes during laryngoscopy, intubation, and laparoscopy and their perioperative stability. We hypothesize that oral pregabalin before induction can obtund the pressor response to laryngoscopy and intubation with minimal side effects. After obtaining institutional ethical committee approval and written informed consent from all the patients, 120 patients of the American Society of Anesthesiologists (ASA) physical status I, aged 18–60 years, scheduled for elective laparoscopic cholecystectomy surgery under general anesthesia from May 2014 to April 2015 were enrolled in the study. All patients were randomly divided into three groups of 40 each after statistically analyzing the power of study (a power of 80% with a confidence interval of 0.05). Patients were randomly allocated using an online research randomizer (http://www.randomizer.org) into three equal groups (40 patients each) to receive placebo (Group I), pregabalin 150 mg (Group II), or clonidine 200 μg (Group III), as oral premedication 60 min before induction. An anesthesiologist not involved in the study was engaged to give the drugs to the patients. The patients with ASA II, III, IV, predicted difficult airway, edentulous patients, and patients with cardiopulmonary, hepatic, renal, ophthalmic, or metabolic diseases were excluded from the study. Patients were randomly allocated to three groups of 40 each. Group III (clonidine group; n = 40): received oral clonidine 200 μg as premedication 60 min before induction with a sip of water. All the patients received tablet alprazolam 0.25 mg and tablet ranitidine 150 mg night before the surgery. Basal HR, systolic blood pressure (SBP), diastolic blood pressure (DBP), and arterial saturation of oxygen were recorded. Patients were administered Vitamin C in Group I, oral pregabalin 150 mg in Group II, and tablet clonidine 200 μg in Group III, respectively, with a sip of water 60 min before induction. Each patient was given injection midazolam 0.02 mg/kg, injection fentanyl 1 μg/kg, and injection ondansetron 0.08 mg/kg in the operation theater. Anesthesia was induced with propofol 2 mg/kg and injection vecuronium 0.1 mg/kg. Hemodynamic changes were noted at predefined interval. During the surgery, injection diclofenac sodium 75 mg was given intramuscularly for postoperative analgesia. If hypotension (MAP ≤30% from the baseline) or bradycardia (HR <50 beat/min) occurred, it was recorded and managed using injection atropine 0.02 mg/kg or according to the preference of the attending anesthetist. Any rise in blood pressure (MAP ≥30% from base or SBP >160 and or DBP >100 mmHg) was treated with nitroglycerine infusion. T12: 10 min after release of pneumoperitoneum. Pre- and postoperative sedation scoring was done as per the Richmond Agitation Sedation Scale (RASS). Pre- and postoperative sedation scoring was done as at 30 min after giving the test drug, preinduction, and postoperatively after recovery. Statistical analysis was performed using the SPSS statistical package (version 17.0, SPSS Inc, Chicago, IL, USA). Continuous variables were presented as mean ± standard deviation, and categorical variables were presented as absolute numbers and percentage. Data were checked for normality before statistical analysis using Shapiro–Wilk test. Normally distributed continuous variables such as HR, SBP, MAP, and body mass index among three groups were compared using ANOVA. The Kruskal–Wallis test was used for nonnormally distributed variables. Categorical variables were analyzed using either Chi-square test or Fisher's exact test. For within the group comparison, the paired t-test was used. For all statistical tests, P < 0.05 was considered significant. The primary objective of the study was to observe changes in HR and SBP between any of the two groups. With the effect size of 0.30 at two-tailed alpha value (0.05) and a beta value (0.2), 120 observations (40/group) were sufficient to detect a significant difference in HR after premedication between any of the three groups, i.e., placebo, pregabalin 150 mg, or clonidine 200 μg, respectively. The demographic data of the three groups were comparable as shown in [Table 1]. HR was comparable in the three groups at preoperative level (P = not significant [NS]); compared to Group I in Group II, HR was lower immediately after intubation, i.e., at T5 and also at T6, T7, T8, T9, T10, T11, and T12 intervals (P < 0.001). However, compared to the Group I in Group III, HR was statistically lower at all the intervals after 30 min of giving the test drug, i.e., after T2 (P < 0.05). Compared to Group II in Group III, there was a significant fall in HR at T2, T4, T6, T8, T9, T10, T11, and T12 intervals (P = 0.012, 0.044, 0.018, 0.001, 0.016, 0.003, 0.001, and 0.001, respectively) as shown in [Table 2]. In intragroup comparison, HR decreased from the baseline in the Group I at T4-T1 (P < 0.001). However, it increased significantly from the baseline at T6-T1, T7-T1, T8-T1, and T11-T1 intervals (P = 0.001, 0.001, 0.004, 0.026, and 0.001, respectively). In Group II, there was a significant fall in HR at T4, T9, T10, T11, and T12 intervals (P < 0.001, P < 0.001, P = 0.001, P < 0.001, and 0.001, respectively). In Group III, there was a fall in HR from the baseline at T2, T3, T4, T6, T7, T8, T9, T10, T11, and T12 intervals (P < 0.001, 0.003, <0.001, 0.001, <0.001, <0.001, <0.001, <0.001, <0.001, and <0.001, respectively) as shown in [Table 2]. There was no statistically significant difference in the mean SBP at baseline in all the three groups as shown in [Table 3]. However, compared to Group I in Group II, there was a significant decrease in SBP at T3, T4, T5, T6, T7, and T8 intervals (P = 0.007, 0.004, <0.001, <0.001, <0.001, <0.001, respectively). Similarly, compared to Group I in Group III, there was a significant fall in blood pressure at T2, T5, T6, T7, T8, T9, T10, and T11 intervals (P < 0.006, <0.001, <0.001, <0.001, <0.001, 0.014, 0.008, <0.001, respectively). However, compared to Group II in Group III, there was a significant decrease in SBP at T6, T7, T8, T10, and T11 intervals (P = 0.042, 0.044, 0.048, 0.045, and 0.037, respectively). In the intragroup comparison as shown in [Table 3], in the Group I, there was a significant fall in SBP at T3, T4, T5, T6, T7, T9, T10, T11 and T12 intervals compared to the baseline (P = 0.006, <0.001, <0.001, <0.001, <0.001, 0.004, <0.001, <0.001, <0.001 respectively). There was a significant increase in SBP from the baseline at T5, T6, T7, and T11 intervals (P < 0.001 at all intervals). In the Group II, there was a significant fall in SBP from the baseline at all the intervals except at T5 (P < 0.05), whereas in Group III, there was statistically significant fall in SBP at all the intervals except T3 (P > 0.05). MAP was comparable at the baseline in all the three groups as shown in [Table 4] (P = NS) and [Figure 1]. Compared to Group I in Group II, there was a significant fall in MAP at T5, T6, T7, T8, and T11 intervals (P < 0.001 at all intervals); however, the incidence of nausea, vomiting, and dizziness was NS in all the three groups as shown in [Table 5]. RASS score was 0 in all the three groups before giving test drug and 30 min after giving test drug. Before induction, RASS scores of −2 in 1 patient and −1 in 3 patients were seen in pregabalin group but all patients in Groups I and 3 had RASS score of 0 (P = 0.199). The score postoperatively after recovery was −2 in 1 patient, −1 in 3 patients in pregabalin group but was 0 in Group III and Group I (P = 0.082). Carbon dioxide pneumoperitoneum for laparoscopic cholecystectomy also increases the arterial pressure, HR, and systemic vascular resistance and decreases the cardiac output. These vasopressor responses are mainly due to release of catecholamines, vasopressin, or both; the reverse Trendelenburg position further decreases the cardiac output. Various methods and pharmacological measures have been sought in literature to control these hemodynamic responses to laryngoscopy, intubation, and laparoscopy. Among these, opioids, beta-blockers, vasodilators, calcium channel blockers, and sodium channel blockers have been used in past. These agents had their own side effects, and hence, the quest to search for an ideal agent still continues. Clonidine, an α2-agonist, has sedative, analgesic, antiemetic effects and maintains a hemodynamic stability by attenuating the response to laryngoscopy, intubation, and laparoscopy. In a study done by Sung et al. where clonidine was used as a premedication, they concluded that it provided hemodynamic stability, spared the use of isoflurane, and reduced the requirement of postoperative analgesia, hence improving the recovery in patients undergoing laparoscopic cholecystectomy. Similarly, pregabalin has been used as premedication in various types of surgeries such as dental extractions, spinal fusion, laparoscopic cholecystectomy, gynecological surgeries, and orthopedic surgeries in different studies suggesting a good analgesic effect as evidenced by lower pain scores. Pregabalin reduced the postoperative pain in laparoscopic cholecystectomy and fentanyl requirement compared to placebo in a study. A single dose of 150 mg pregabalin given 1 h before off-pump coronary artery bypass grafting attenuated the stress response to endotracheal intubation, did not show any effect on perioperative opioid consumption, and was devoid of side effects. Although these drugs have been studied individually, there is a paucity of studies comparing the effects of pregabalin versus clonidine premedication on hemodynamic response to laryngoscopy, intubation, and pneumoperitoneum. The present study compared the efficacy of oral premedication with pregabalin 150 mg and clonidine 200 μg administered 1 h before induction of anesthesia for attenuating the pressor response to laryngoscopy, tracheal intubation, and pneumoperitoneum in laparoscopic cholecystectomy compared with placebo by dividing 120 patients into three groups of 40 each. The HR, SBP, MAP, and sedation score was observed at predefined intervals. There was significant rise in HR at different intervals in the Group I as compared to Groups II and 3. However, HR was significantly lower in the clonidine group as compared to the pregabalin group at various intervals of T2, T4, T6, T8, T9, T10, T11, and T12. There was a significant bradycardia in Group III which required treatment with injection atropine in 15% of cases. In a study by Asmita et al., 100 patients were divided into two groups to receive clonidine 100 μg and 150 mg pregabalin as premedication. Hypotension and bradycardia were observed in their study also in 4% of cases in the clonidine group which was 15% in our study due to lower dose of clonidine used in their group. In another study also where clonidine 150 μg was used as premedication for patients undergoing laparoscopic cholecystectomy, 4 out of 25 patients developed bradycardia, whereas in our study, 6 out of 40 patients developed bradycardia after creating pneumoperitoneum requiring injection atropine as shown in [Table 5]. SBP was significantly lower in Group II compared to Group I immediately after intubation, 1, 3, 5 min after intubation, and 15 min after pneumoperitoneum (P < 0.05). In a study where pregabalin 150 mg was used as premedication, SBP was significantly lower after anesthesia induction, at intubation, and 1 min postintubation compared to placebo in 60 ASA I, II patients undergoing elective surgery under anesthesia. However, HR did not differ between the two groups at all the points. The blood pressure was significantly lower in Group III compared to Group I immediately after intubation, 1, 3, and 5 min after intubation, and 15 min after pneumoperitoneum (P < 0.05) which was also similar in the study conducted by Singh andArora and Gupta et al., In the study conducted by Gupta et al., Group I was administered placebo, Group II was administered pregabalin 150 mg, and Group III was administered 200 μm of clonidine, and the attenuation of MAP in premedicated group was statistically significant as compared to control group after laryngoscopy and remained stabilized during intraoperative period. In our study also, MAP was significantly lower in both clonidine and pregabalin groups throughout compared to baseline except immediately after intubation. The significant attenuation of MAP was also found compared to placebo in a study done by Rastogi et al. where patients were divided into three groups, Group I received placebo, Group II received pregabalin 75 mg, and Group III received 150 mg pregabalin. Thus, pregabalin 150 mg was able to achieve hemodynamic stability with no postoperative side effects with no difference in recovery and awakening times. In the study by Asmita et al., preoperative sedation level was higher in the Group II (pregabalin 150 mg) compared to clonidine 100 μg, which was used in 100 patients divided into 2 groups. In our study, 6 patients in Group I required treatment with nitroglycerine infusion to control the SBP during pneumoperitoneum, but no intervention was required in Groups II and III indicating better hemodynamic stability among the premedicated patients. Six patients in the Group III developed hypotension in the intraoperative period which responded to intravenous fluids. There was no statistically significant difference in RASS score among the three groups at 30 min after giving test drug, before induction, or postoperatively after recovery. Pregabalin when used as 150 mg single dose before induction obtunds pressor response and can be safely used as routine premedication in elective laparoscopic cholecystectomy with minimal side effects compared to clonidine 200 μg. Mehta PJ, Chavda HR, Wadhwana AP, Porecha MM. Comparative analysis of spinal versus general anesthesia for laparoscopic cholecystectomy: A controlled, prospective, randomized trial. Anesth Essays Res 2010;4:91-5. Channaiah VB, Kurek NS, Moses R, Chandra SB. Attenuation of hemodynamic response to laryngoscopy and endotracheal intubation with pre induction IV fentanyl versus combination of IV fentanyl and sub lingual nitroglycerin spray. Med Arch 2014;68:339-44. Joris JL. Anesthesia for laparoscopic surgery. In: Miller RD, editor. Miller's Anesthesia. 7th ed. New York: Elsevier Churchill Livingstone; 2010. p. 2185-202. Das M, Ray M, Mukherjee G. Haemodynamic changes during laparoscopic cholecystectomy: Effect of clonidine premedication. Indian J Anesth 2007;51:205-10. Sugiura S, Seki S, Hidaka K, Masuoka M, Tsuchida H. The hemodynamic effects of landiolol, an ultra-short-acting beta1-selective blocker, on endotracheal intubation in patients with and without hypertension. Anesth Analg 2007;104:124-9.
van den Berg AA, Halliday EM, Soomro NA, Rasheed A, Baloch M. Reducing cardiovascular responses to laryngoscopy and tracheal intubation: A comparison of equipotent doses of tramadol, nalbuphine and pethidine, with placebo. Middle East J Anaesthesiol 2004;17:1023-36. Parveen S, Negi DS, Kumar R, Bagwan MC. Oral clonidine vs. oral pregabalin premedication to attenuate pressor response to direct laryngoscopy in patients undergoing laparoscopic cholecystectomy: A randomized double blind study. J Clin Diagn Res 2016;10:UC21-5. Gupta K, Sharma D, Gupta PK. Oral premedication with pregabalin or clonidine for hemodynamic stability during laryngoscopy and laparoscopic cholecystectomy: A comparative evaluation. Saudi J Anaesth 2011;5:179-84. Paul S, Biswas P, Bhattacharjee DP, Sengupta J. Effects of magnesium sulphate on hemodynamic response to carbon dioxide pneumoperitoneum in patients undergoing laparoscopic choleystectomy. Anesth Essays Res 2013;7:228-31. Sung CS, Lin SH, Chan KH, Chang WK, Chow LH, Lee TY, et al. Effect of oral clonidine premedication on perioperative hemodynamic response and postoperative analgesic requirement for patients undergoing laparoscopic cholecystectomy. Acta Anaesthesiol Sin 2000;38:23-9. Agarwal A, Gautam S, Gupta D, Agarwal S, Singh PK, Singh U, et al. Evaluation of a single preoperative dose of pregabalin for attenuation of postoperative pain after laparoscopic cholecystectomy. Br J Anaesth 2008;101:700-4. Sunder AS, Kodalin R, Sulaiman S, Ravullapalli H, Karthekeyan R, Vakamudi M. The effects of pre-emptive pregabalin on attenuation of stress response to endotracheal intubation and opiod sparing effect in patients undergoing off-pump coronary artery bypass grafting. Ann Card Anaesth 2012;15:18-25. Chaudhary A, Sanghvi K, Parikh H. Oral premedication with pregabalin and clonidine for haemodynamic stability during laryngoscopy: A comparative study. Int J Basic Clin Pharmacol 2015;4:294-9. Singh S, Arora K. Effect of oral clonidine premedication on preoperative haemodynamic response and postoperative analgesic requirement for patients undergoing laparoscopic cholecystectomy. Indian J Anaesth 2011;55:26-30. Salman E, Celik C, Candan S. Premedication with single dose pregabalin 150mg attenuates hemodynamic response to laryngoscopy and tracheal intubation. 2012;1:297. [doi: 10.4172/scientific reports.297].